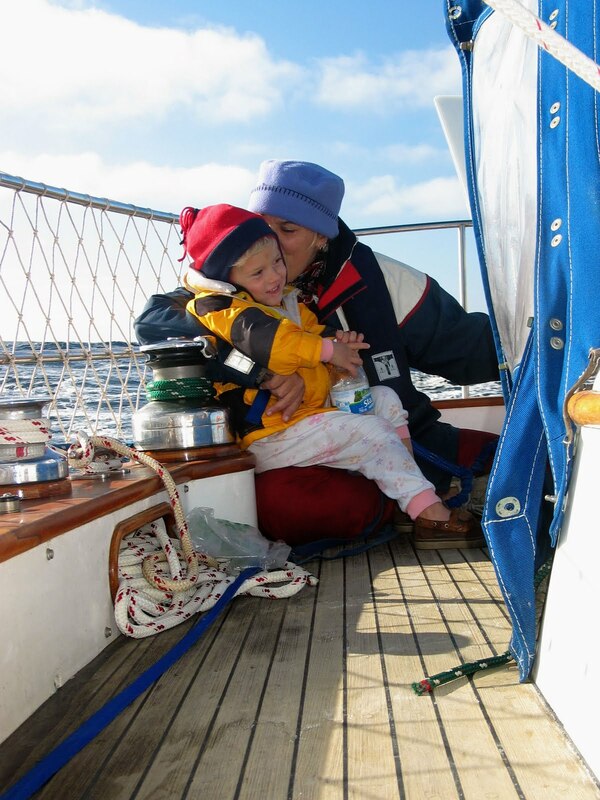 When we moved aboard our 1961 Pearson Triton back in 2002, the most common question we were asked was “Isn’t it hard living aboard a sailboat with a baby?” Our daughter Lola was then 8 months old, already crawling, and fast approaching that age when mobility and exploration are critical to a baby’s development. At the time it seemed like a natural progression to be moving our soon-to-be-mobile baby onto a 28-foot floating home, even as our parents imagined her crawling right off the deck. By then, our minds had long been set on the goal of setting sail with our children, our house and material goods had been sold into the caring hands of others, and Lola seemed as willing as her parents to embark on this watery path. I realized only much later that for people back home, the hazards of living on a boat with a baby seem more extreme, the possibilities for mishap endless. We watched landlubber friends gasp as they reached protectively for toddling Lola scrambling around deck. But the comparison was brought into sharp relief when, a few years later, we gasped in the very same way as our children ran into in the urban yard of those same friends and seemed dangerously close to the passing traffic. Our friends and their kids were perfectly calm, but for us, the nearby cars were more frightening than ocean waves. In short, our children treat the dangers of the sea in the same way that city-dwelling kids treat the speeding roadways that they live with every day. They are mindful of the hazards, they heed their parents’ repeated warnings, and they play close to the edge nonetheless. It’s a matter of perspective, and what you are used to. While a sidewalk marks the boundary between the safe yard and the streets of Baltimore, the lifelines, netting and harness create the necessary border between life and death on board a boat. 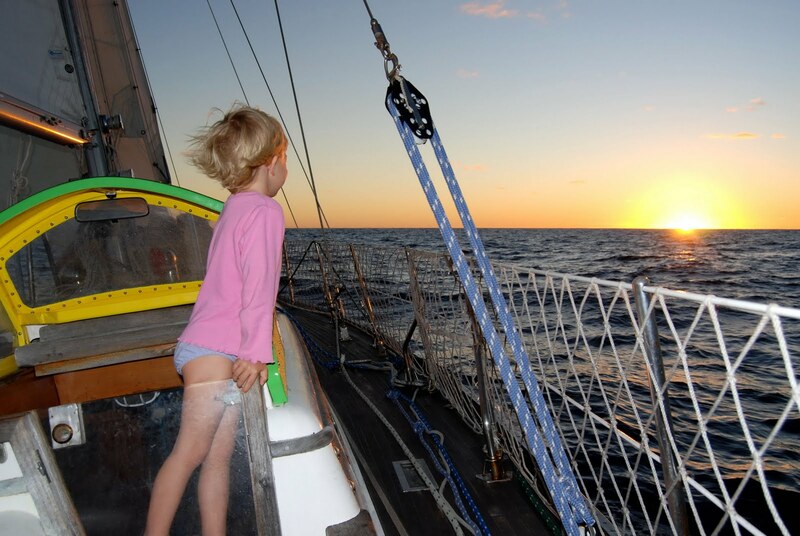 Even more surprising to me than our land-based friends’ disbelief when we set sail for more distant waters was the response from other sailing families. I have frequently met seasoned cruisers sailing with older kids who hold the opinion that sailing with babies must be really difficult. The commentary ranges from “You must be very brave!” to “You must be crazy!” As colorful as that makes us sound, we are neither, really. The truth is, if you take your childcare as seriously as you take your safe boat handling, living on board with babies comes naturally. And if you start out from the very beginning (the earlier, the better), the changes come, well, one baby step at a time (which seems infinitely easier to me than prying a teenager away from his cell phone, X-Box, and D&D club). 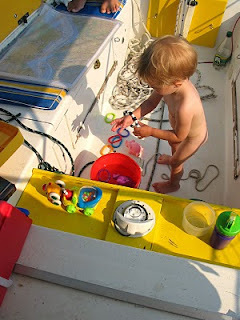 There are so many reasons why living on a boat is in fact quite amenable to babies: the settees are fixed places for them to pull up and toddle around; the corners are rounded and provide nice handholds; the leecloths make ready-made romper rooms. And that netting you see on baby-boats? Not only does it keep your baby on deck but it will also save numerous tools and toys from a deep-sea end. For us, less equipment for the baby means more room to travel. No stroller, no crib, no bottles of formula. We had always been pretty basic in our outlook of what we needed, and having a small baby on board further emphasized this point. Bernie has often mused that whatever kind of personality you were back in your shore-life, you are bound to continue to be on a boat – except that your characteristics (or quirks, as the case may be) will become more pronounced. A packrat will continue to squirrel away items in those hard-to-get-at lockers. A planner, a scheduler, a time-keeper will not shed that watch lightly, and might like to make reservations in marinas along the way, just to be on the safe side. If you once possessed a tidy kitchen and organized desktop when you were a house-dweller, you will be among the lucky ones who can locate the spare paper towels or the 9/16” wrench when you need them. If you are slightly more chaotic (and this one I can relate to, since I live with someone who is neither tidy nor a list-keeper), well, your life on board might veer towards degrees of entropy. You get the idea: there are all types out here, everyone finds their own comfort zone on board, and you can only change so much, even when you shed your shore shackles and sail off into the sunset. The same goes for pregnancies and babies on board. If you find pregnancy tiring and difficult, it may be so on board. If you are prone to slight neuroses, the sort who reads every book written about what-to-expect-when..., then you will be more likely to discover some neuroses about your baby on board. And let’s be clear about the discomforts of pregnancy: going to sea is no cure for morning sickness, and diapers do not magically clean themselves in a gale. A few years back, we were motoring out of Vancouver’s Fraser River at an evil morning hour, when the wind kicked up to 25 knots against the outgoing tide. This was the only occasion when both our daughters awoke throwing up, the eldest (four at the time) exclaiming with shock, “Mama, I think I have The Seasickness!” (It was, quite clearly, something mythical that she had not yet experienced first hand.) I stayed below with the girls while Bernie motored to the mouth of the river over the next several hours, and quickly abandoned any hope of keeping myself vomit-free – my shirt became a towel; my lap may just as well have been the bowl or bucket I’d perched for each of my kids. Yes, things can get messy. Choosing this life with your babies on board is just that – it’s a choice, and one you make freely. Embracing that choice and seeing past the discomforts can lead to a kind of enlightenment (yeah, sure, you say; but believe me: I’ve been vomited on by two people at once and I still especially love sailing with my children!). It’s a state of mind, really, this sailing with babies. Becoming adaptable is probably the best thing I’ve learned from having babies on board. That and the less-is-more approach to pretty much everything. You don’t have room for all the accoutrements you might accumulate in a house, so you use what you have. 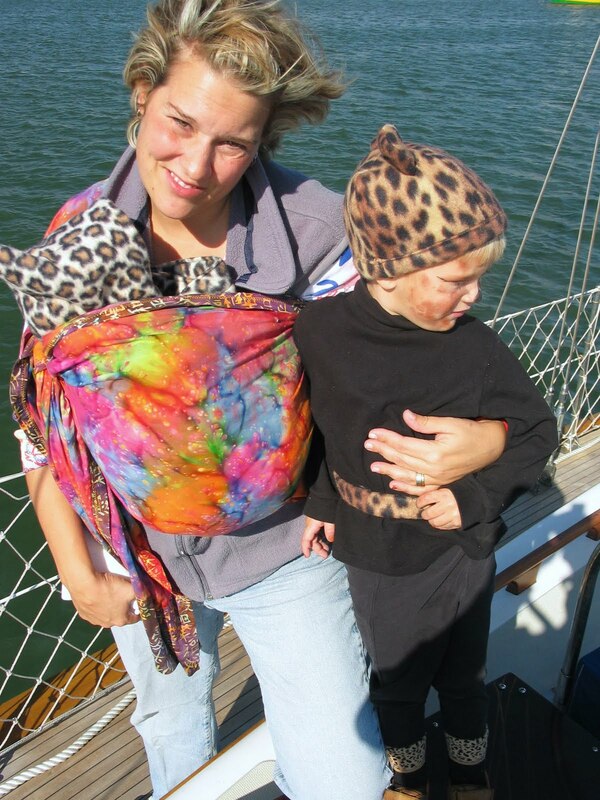 We made slings and baby carriers in lieu of strollers with both of our children. We slept with our babies too, but if that’s not for you, then pilot berths and V-berths make great substitutes for cribs. And exercise? Kids get plenty of that on board, even if you do not. A kid will put any length of line to use -- turn it into a swing, make a leash for a stuffed animal, tie a sibling to the mast. Of course, the less-is-more motto works especially well if you breastfeed your baby on board. Yes, watches can be tiring if you have to feed intermittently through the night, but the pay-off is worth it. At the risk of sounding a little too earth-mother, what better way to nurture your babies while at sea? Nature does it all: the wind pushes you along, and you don’t have to measure out formula on a heel. No diesel, no bottles. Less mess, better nutrition. What more could you ask for? With both my babies, I let nature take care of them across time zones and bodies of water and found this to be one of the most practical (and most comforting) things in the world. 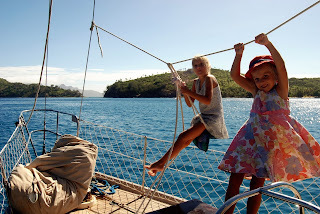 In terms of sailing in adverse conditions, we can take a cue from our children as well. We find that their confidence builds as ours does – or is it the other way around? 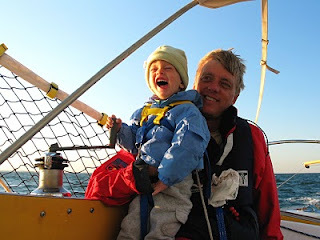 At any rate, we try to maintain a sense of cool while emphasizing the risks of sailing offshore with both our kids, and they seem to have adopted a healthy, balanced attitude. 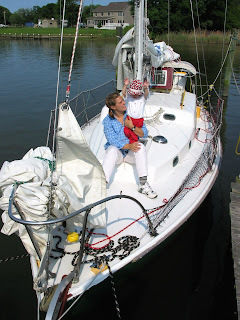 I’ll never forget Lola’s laughing face (at age two) when we sailed down the Chesapeake Bay one afternoon in a 25 knot headwind, spray splashing us all the way to Annapolis (we had no dodger). I kept looking for signs of distress, but she stood all afternoon on the cockpit seat, harnessed into the floor, one arm around her father’s neck and one hand on the bimini frame. And she laughed with every splash. It could have been easy to grumble about the wind – it was our last leg back to Annapolis after a summer in New England, and a calm sail into harbor would have been more pleasing, to be sure. But her joy was contagious. She and Bernie were in their element, and I’ll never forget the image of those two great big grins. 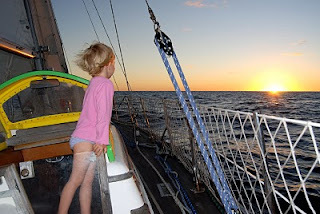 A year later, Lola’s sister Jana made her first offshore ten-day passage (Ensenada to Puerto Vallarta, nonstop) when she was three months old, tucked gently among cushions in the leeward bunk (with Lola romping all around). I recall my only worry on that trip was what to do with the very large marlin who had become interested in our trailing lure (he threw the hook, much to our relief). We then set sail to Hawaii with a bouncy 3-year-old Lola and a 7-month old Jana, and found the three week crossing hassle-free – and no thanks to the weather either: we experienced strong tradewinds combined with a cross-swell sent our way from a gale off of California and thus sailed with 30+ knots and steep 12-15’ seas for ten days straight. But even in those conditions, sailing with a baby was easy. She ate, slept, played, cooed, and pooped. That’s pretty much what babies do, on or off a boat. Three-year-old Lola, meanwhile, found her sea legs quickly and romped around as if nothing was unusual about those 21 days, morning, noon, or night. Adaptability comes naturally to small children, and it was in those uncomfortable days on that passage that I really noticed how much we can learn from the light spirits of children. Our daughters have become hearty offshore sailors who understand the need for equal doses of caution and a sense of freedom. Sometimes they even wax philosophical about their sea-bound life. It was in a gale off of Oregon a couple years back when Lola quite happily declared: “The waves are my spirit, the water is my life!” OK, we’re not all quite so poetic about being hove-to in a two-day gale, but it did serve as a great reminder to embrace the moments we have on board, and to do it with gusto. Even if you are wet and cold. As I write, it is slightly raining and my daughters are outside, swinging on the halyards. I urge them inside; I think they will get cold. No, they declare, they are having too much fun. Lola pushes herself out as far over the water as she can, and I hear her laugh with Jana and say, “This is my best swing ever!” I smile as I remember an older cruising couple anchored nearby who recently commented about our kids’ foredeck antics, how they expressed a sense of awe and wonder at the children. How they thought them very brave. Yeah, I think to myself now: brave and crazy. And then I remember that people have said the same about their parents. This article appears in the August 2010 issue of Blue Water Sailing. Thanks to the editors there for sharing our experiences with their readers. Hello. I've been lurking on your site for some months now, living vicariously your fabulous adventure. Bernie's Church of the Rebar Jesus was recommended to me by a neighbor, who is apparently a friend-of-a-friend of yours or some such. Anyway, I couldn't be more in agreement with the lot of you (on all accounts, it seems), and I love the pictures and descriptions of a life I'd love to live myself if circumstances were differently aligned. as always a great story telling. Your writing is phenomenal and I feel as I was there on that beautiful MOMO with you. Keep on telling these stories, I love them. Thanks so much, Bil. I'd love to know how we're connected, who that friend-of-a-friend-of-a-neighbor is... If you're down the New Zealand way, do let us know; we'd probably have a lot to talk about! And Joe - thanks for reading, as always. When are you coming this way? The neighbor in question is Liz Witek (nee Truesdale); her husband Tom is an endodontist. My sense is that our connection is a friend of theirs. I'm an airline pilot, currently about 7,000 miles away from home, but I'll try to remember to ask when I return in a week or so. lola's words are so her, too, amazing kid and spirit. this was a great one, keep them coming. Thanks for writing this post. 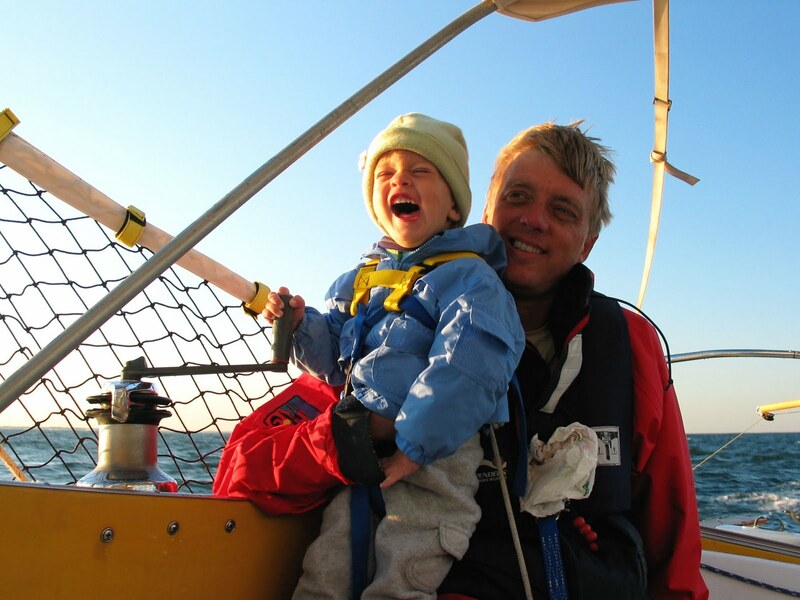 I've a two year old son I'd like to take sailing and appreciate you sharing you're experience. Thanks for sharing this and your other musings. My hubby and I are in the process of selling everything, purchasing our first boat and moving aboard with our (big) dog. And then, after a few months of sundowners, starting our family. While I'm headstrong, excited, and voraciously preparing, I have those moments of thinking "am I really doing this!?! ", "what will others think" (we haven't told a lot of our landlubber friends back home, yet) and "be more practical" (ie work to death on land, yuck!). It's posts like these that keep me focused, inspired and ready. I look forward to meeting y'all on the big blue! Enjoyed this post as well, and though from 2010, very timely now. Thanks!